Appalachians are historically suspicious folk. It probably started in 1792 when George Washington led about 13,000 militia to Pittsburgh. After trying to resolve the issue peacefully, several small farmers still refused to pay a new tax on distilled spirits that had been meant to relieve the financial burden of the Revolutionary War. According to the frontiersmen, it was an unfair abuse of federal power. During this time, grain was often distilled as a form of preservation. The tax was not overwhelming to the large plantation owners (such as George Washington), but to the small farmer who often lacked funds and bartered for goods, it was exploitation. Eventually, the angry farmers became violent in their protests of the tax and, in typical hillbilly fashion, started burning stuff down. Thus, the Whiskey Rebellion began, Washington marched in, and frontiersmen died or fled for the safety of the hills. My mother, a product of Jesse Stuart’s Greenup County, is your typical hillbilly (who wears nothing but J. Crew and loves a good fire). After continually hearing of the multiple health benefits of sauerkraut, I called her for a recipe. What proceeded was a lecture on how to properly choose sauerkraut and how to avoid cancer. According to Gigi, one should only buy sauerkraut in a glass jar…. Never a can….. Cans=certain death. Also on Gigi’s Conspiracy Theory List: plastic microwaveable containers, over-medicated America, and mailboxes (they completely refuse to have one). 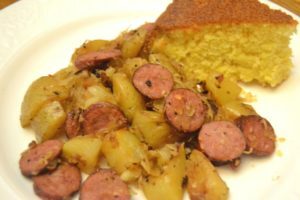 This recipe is great for the family who is slightly skeptical about sauerkraut. We started with adding the sauerkraut in slowly, but next time I may even add more. Enjoy and God bless! I was a little hesitant about introducing sauerkraut to my family as I wasn’t sure how well the strong flavors would be received. Solution? Mix it with some meat an potatoes for a sure win. 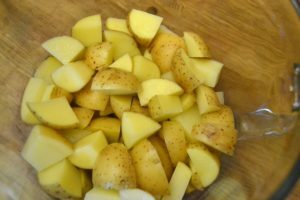 Start with about 3 cups of diced, yellow potatoes. 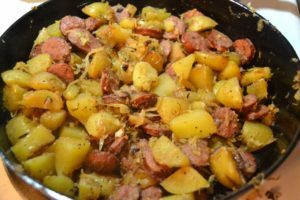 Cook polish sausage in a skillet (preferably cast iron, of course!) on medium heat for 3-4 minutes. Side note: I buy the all-beef version…. (Gigi has made me skeptical of meat-mixtures). I like at least one side of the sausage to brown. Remove sausage from skillet and set aside. Leave the grease and add the potatoes. To the potatoes, I added some finely chopped onion, minced garlic, dry mustard, salt, and pepper. 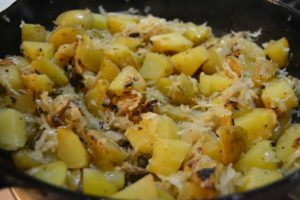 Cover and cook until potatoes start to brown–about 5-7 minutes–stirring occasionally to prevent it from sticking to skillet. Lightly rinse and drain the sauerkraut. Add to skillet and mix well. Rinsing removes the strongest odors, and I wonder if it removes a bunch of health benefits. Do you know? Email me or comment below. Either way— it’s looking and smelling delicious. Return sausage to skillet, mix well, and cook until potatoes are tender. What meal is complete without cornbread? YUM! 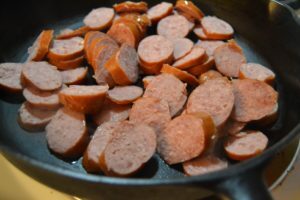 Brown sausage in skillet, approximately 3-4 minutes. Remove sausage from skillet and leave grease. 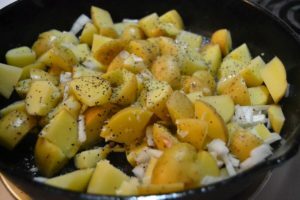 Add potatoes, garlic, onion, dry mustard, salt, and pepper to skillet. Cover and cook 5-7 minutes (or until potatoes start to brown), stirring often. Add sauerkraut to skillet, mix well. Add sausage to skillet. Cook until potatoes are tender. Serve and enjoy! Yield: about 4 servings.